In mattresses, just like in life, you often get what you pay for. If you’re willing to invest in superior quality, then quality is exactly what you’ll get. The Sleep Master Spring 10 Inch Pillow Top RV Mattress (queen size) retails at $300, but it gives you a quality that you definitely won’t get with much cheaper alternatives. If you’re searching for a mattress that gives you superior comfort, exceptional support, and an uninterrupted full night of sleep, then this could be the mattress you’ve been looking for. The first question people usually ask when looking at their options is what makes a certain product stand out from the rest of the crowd. This mattress is just one of the many you can purchase after all, but it’s unique because of the amount of detail and thought that was placed into the its manufacturing. With the Sleep Master Spring 10 Inch Pillow Top RV Mattress, you don’t just get the usual mattress available just about anywhere. You get the best innovations in technology that allows the mattress to give you maximum support, and this will be discussed in more detail as the product features are laid out one by one. The spring and foam layers are standard for any mattress, but having the additional fiber padding, fire barrier inner cover, and Poly Jacquard fabric cover make this mattress extra unique. The 7.5-inch spring unit is comprised of hundreds of independent iCoils. The iCoil system minimizes motion transfer and what this means is that even if your sleeping partner moves around a lot, you will not feel that motion at all and thus your sleep will not be disturbed. Aside from this motion separation quality, the iCoil system also customizes the spinal alignment of everyone who lies down on it. This means that your spine and back are given full support and you don’t have to worry about aches and pains when you wake up from a restful slumber. On top of the iCoil system you get more inches of high-density and high-quality foam, which gives you maximum comfort and durability. On top of the coils are 3 layers of foams. The first is a 0.5-inch high-density foam, on top of that is 1.5 inches of comfort foam, and on top of that is an inch of pressure-relieving comfort foam. These 3 foam layers on top of one another are made this way to give maximum comfort. For a worry-free purchase, the Sleep Master Spring 10 Inch Pillow Top RV Mattress also gives you a product warranty that’s good for 10 years, and this gives you an idea of just how important quality and security are for the manufacturers. This also gives the customer unparalleled security because no matter what happens, you have a 10-year warranty to back you up. When it comes to who will benefit most from this mattress, it’s basically the ones who really want maximum comfort when they sleep. If you’re willing to invest a few hundred dollars for a restful sleep and superior comfort, then this is the mattress for you. In particular, if you have a sleeping partner that’s fond of moving a lot, and you find this really problematic because it disturbs your peaceful sleep as well, then this mattress will definitely benefit you. With the Sleep Master Spring 10 Inch Pillow Top RV Mattress, you will never be disturbed in your sleep again. The Sleep Master Spring 10 Inch Pillow Top RV Mattress is very well-reviewed, and on Amazon it has a rating of 4.4. out of 5 stars with about 655 reviews. Many people who have actually tried this mattress are very satisfied with their purchase, and all of the product features and benefits are just as they say. Many users comment that the mattress is of exceptional quality, with just the right amount of firmness (medium-firm). It’s firm enough to give your back full support and alignment, but not too firm as to remove the comfort from the mattress. Other reviews also mention that while opening the tiny package, cutting the plastic, and seeing the mattress reach its full size before your very eyes is an experience in itself, you’ll need to wait at least 24-48 hours for it to turn to its full shape. Also, you will have to open some windows to really air it out, because the plastic a bit of odor and some fumes. This is perfectly normal and the odor vanishes after a few hours of airing out. 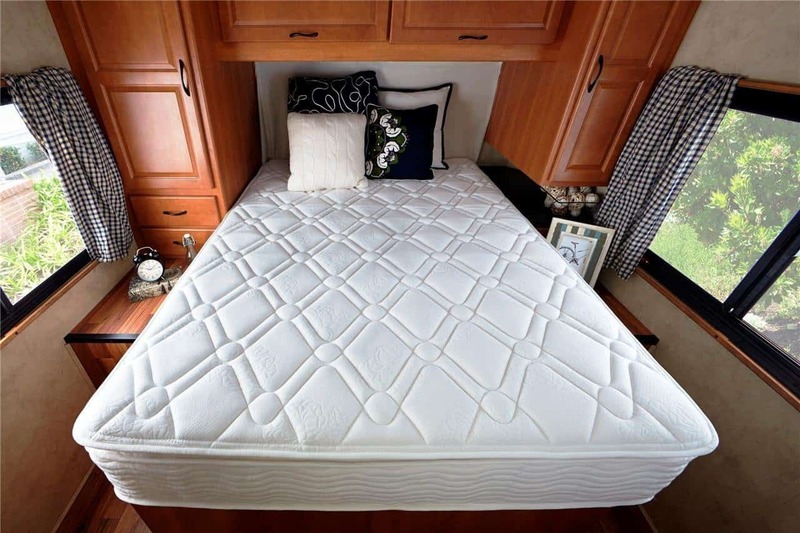 If you’re looking for a nice queen-sized mattress and you’re willing to actually pay a couple hundred dollars for it, then the Sleep Master Spring 10 Inch Pillow Top RV Mattress could be the one for you. You can search through many other mattress options but you won’t find something that’s as well-structured and well-constructed. This mattress and all of its 10 inches is truly a comfort innovation, and if you’ve examined all the pros, cons, and considerations and find it to be aligned with what you’re looking for, then go ahead and make the purchase now.